I thought I had solved the problem of tyres by running a 6" bike wheel fore and aft with 190x40x17 car tyres fitted. But I read in this forum that bead seats are different. 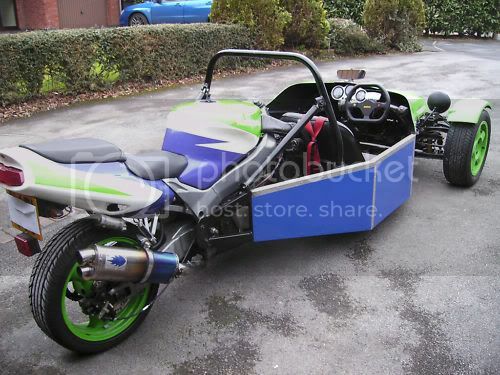 I have seen a trike that used a ZX9R bike to push it along and that seemed ok? can you machine the bead seat on the bike wheel to suit? Can someone shed some light on this topic. The simple answer is DON'T DO IT! It can be fatal. Car tires on car rims, bike tires on bike rims, no matter what anyone says and no matter how many Gold Wingers and others are doing it. what Gazza and cudgel said 1000 times over regardless that people do it. I don't have the exact #'s in front of me but besides the rim profiles being completely different, bead seat diameters are also different on car and motorcycle wheels. In the case of 17", the motorcycle rim diameter is significantly smaller than a car rim. So a car tire slips easily on to a motorcycle rim but it's wrong because the rim can move around on the bead seat. Basically the tire has to be over inflated to secure it to the rim but there is always the possibility of catastrophic failure. Taken from these specs, here are the diameter differences between car rims and motorcycle rims. The chart also shows the difference in profile for the standard car rim and motorcycle rim. Wheel size	15"	________ 16"_________ 17"_________ 18"
The current wisdom is don't do it. That said, Kosman Specialties has been machining the bead off motorcycle wheels and putting an automotive bead on, for years, for the drag racing crowd. They can also widen the wheel and/or change the offset.